THE types of western objects that excited the imperial imagination included not only paintings, sculpture, musical instruments, weapons and exotic animals, but also examples of European clothing. Indian princes demonstrated a keen interest in European things, which they collected and prized in precisely the same way that rare and wondrous objects from Asia were in the West. 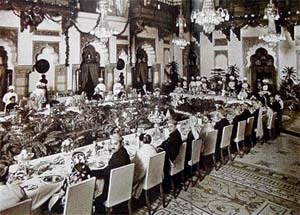 Indian princes allied to the various Western trading companies showed a taste for western goods that reflected their political loyalties. On a practical level too, Indian elites who negotiated and fraternised with Europeans eventually began to adopt aspects of western lifestyle and behaiour, such as sitting on a chair instead of on textiles on the ground. As subject peoples in an imperial system there was no greater honour for an Indian prince than to meet his ruler. For formal events such as presentation at court, Indians were instructed to wear ‘proper Durbar dress’ complete with national or tribal headgear. It was in romantic Oriental garb that Queen Victoria and her successors wanted to view the exotic peoples of the Empire. As surviving negatives from London’s fashionable photographic studio Lafayette show, Indians routinely called in on the way to court in order to be photographed on the day they met the sovereign. Whether buying mirrors in Venice, porcelain in Dresden or jewellery in Paris, shopping was an indispensable part of a European tour. For first time visitors, it was essential on arrival to acquire western-style clothes. The colourful apparel of Indian princes aroused attention, and the sooner they adopted full western dress, the sooner they were able to appear inconspicuous during their travels. So outlandish was his dress considered, that while sitting on a bench in the Musee Grevin in Paris, a courtier trave lling with Jagatjit Singh of Kapurthala was mistaken for one of the museum’s waxwork figures! 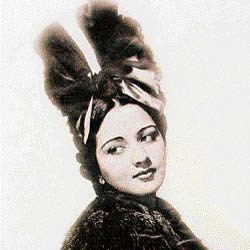 Indian women too sometimes adopted western clothes when traveling in Europe, as did Rani Kanari, wife of of Jagatjit Singh of Kapurthala, and Chimnabai, wife of Sayaji Rao III of Baroda. The social round in London also necessitated particular type of dress, such as an evening suit and top hat, both of which could be acquired by outfitters in and around Savile Row. For westernised princes, visits to Europe provided an opportunity to order clothes and update their wardrobes with the latest fashions. 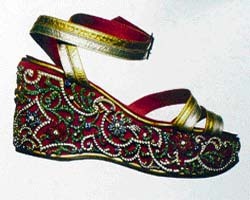 Western clothes, shoes and handbags, were also becoming an indispensable part of a royal bride’s trousseau and visits to Europe provided an opportunity to choose the latest creation from leading fashion houses. 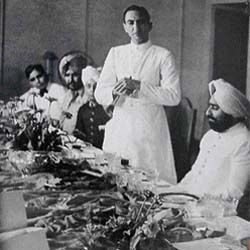 Sayaji Rao III was so regular a client of Henry Poole & Co., that he awarded the company a royal warrant. ...the most fabulously beautiful young Indian lady, holding the longest cigarette holder I had ever seen, wearing a brilliant silk sari and covered with pearls, emeralds and rubies. She was quite poker-faced but had a pile of chips in front of her to testify to her success and to top it all she had a live turtle, whose back was laded with three strips of emeralds, diamonds, and rubies and which she was using as a talisman. Every now and then the creature would crawl across the table but every time she caught it back. The crowd was totally mesmerised by her. The change in the circumstances of maharajas over the past sixty years has brought about the dispersal of many princely collections. The fabulous jewels commissioned with aplomb in days of grandeur have been largely sold piecemeal at international auctions, or are in hiding, away from the attention of tax officials. The palaces built on a vast scale are now chiefly hotels or museums and their contents, paintings, libraries and chandeliers, cars and works of art have in some cases been sold to pay for expenses or to settle family disputes over inheritance. 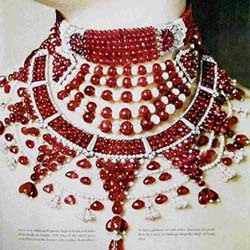 Still, the romance of princely Indian exists, evident, for instance, in the mesmerising display arranged by Cartier in 2002 of the reconstructed Patiala diamond necklace. Although set with cubic zirconium, this tour de force of jewellery, and the glamorous story behind it, captivated western audiences and brought to the fore the myth of the maharaja and the appeal of the age gone by.